← Internet Pet Scams – Don’t be a victim! Flying with a pet? Have questions regarding airline pet policy? Need to know what type of carrier you will need? What does your pet need to fly as cargo? Will the airlines transfer your pet from one plane to another? Post your questions here and we will respond within 24 hours. You can also find information here: airline pet policies. Jennifer – ANA will not allow your pup to fly in the cabin as their pet policies will not allow it. 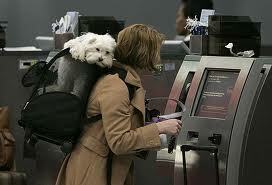 Your pup must fly as checked baggage in the cargo hold. You can try United as they fly your route nonstop; however, they may not allow your pup in the cabin as the flight is over 9 hours. If they say no to that flight, ask about their flight to SFO where you will clear customs and then board a flight to IAH on another itinerary. Another option would be Air Canada to or through Toronto. Pet owners planning to export their pets from Japan should apply for export to Animal Quarantine Service at least 7 days prior to export. I will be flying on Saturday April 13th via NH174 from Tokyo to Houston, Texas in Business Class. I am looking to adopt a small puppy that is ~ 1 pound and is a Toy Poodle. I have concerns with cargo travel for that distance considering the age. I was wondering if it can travel in the cabin considering the age and weight. Are there any other options? Natalia – you need to call Lufthansa back and re-verify the interlining of your pet. As a general rule, the airlines do not interline pets unless there is an extremely close code sharing agreement or the other airline is owned by the parent airline. If they do not interline your pet, you will need to claim it and clear customs in Germany. Their regulations will apply: https://www.pettravel.com/immigration/Germany.cfm. Hello there! I am traveling with my dog (she is the cargo hold) from Kiev to Toronto. I bought a ticket Kiev-Toronto from Lufthansa with 1.5h layover, however only the first part of the flight (Kiev-Frankfurt) is operated by Lufthansa, the second part (Frankfurt-Toronto) is Lufthansa flight operated by Air Canada. I have all documents ready for my pet entering Canada and they don’t require to do a blood titre test, however as I know EU countries do need it. Will I need this test for my dog to be transported from one flight to another while I will have 1.5h layover in Frankfurt? I do not plan to leave the airport. I called Lufthanza and they told me that they will transfer my dog from one flight to another (and so I do not need to check her as baggage again and she will not go through customs again). Charles – a health certificate is not required as you are flying within the United States unless your airline requires it. Some do and some don’t. Best to check with your airline. You can find airline pet policies for over 160 airlines here: https://www.pettravel.com/airline_rules.cfm. I would like to bring my pet cockatoo salmon crested from Atlanta to San Jose ca. do I need any documents for my pet? Julia – you may want to discuss flying your Pom with Lufthansa. Your Pom will need to fit comfortably in an airline-compliant pet carrier like these: https://www.pettravelstore.com/pet-carriers/. The largest one we have is the SturdiBag XL carrier. Otherwise, your Pom will need to fly in an IATA-compliant pet carrier like these: https://www.pettravelstore.com/pet-crates/. The Summer Heat Embargo does start on May 15; however, Lufthansa will look at the temperatures on the day of traveling. If you think they will be a problem, try to schedule a flight that departs very early in the AM or late in the PM. Hello! I am moving from Los Angeles to Germany in May. I am looking into all the options for traveling with my 9 pound Pomeranian. My final destination is Berlin, but since there are no direct flights there I will likely go LAX – FRA. He is a small dog but not tiny. Would any airline allow me to take him on board? I’ve also heard that some airlines won’t allow pets in cargo after May 15. What’s the best option? Tina – if you fly with Air France, you will need to clear customs and recheck your cat on the next flight as Air France will want to collect another pet fee. Not a big deal with an EU Pet Passport but you will need time on the layover to do that. Better to choose the direct flight unless TunisAir will not accept your cat in the cabin (if that is your goal). We would also advise that, because Tunisia is classified as a high-rabies country by the EU, you get your cat a rabies titer test according to steps 1-3 here: https://www.pettravel.com/immigration/UnitedKingdom.cfm. If the results can be recorded in your cat’s EU Pet Passport, it will be MUCH easier to return to the UK.